Kirk Deeter was one of the other guys on the trip to Long Island, Bahamas to explore the DIY bonefishing at the Long Island Bonefishing Lodge. He writes for Field and Stream and is the new Editor for Trout Magazine. He's also an all around great guy and I hope our path's cross again some day. Here is his take on the trip to Deadman's Cay. I just returned from a remarkable bonefishing trip in the Bahamas--Long Island, to be specific. 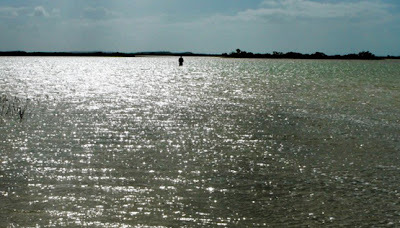 It's a stripped-down, do-it-yourself deal, involving big bonefish (a 5-pounder won't bat an eye), unspoiled flats that most people don't have the stamina to walk across in a week, let alone fully explore (I'm talking miles and miles of knee-deep water), great food and wonderful cultural experiences. This is authentic island fishing. You feel your blood pressure drop the minute you get off the plane, and it doesn't tick up a blip until the moment you see a big tailer cruising your way. Check out longislandbonefishinglodge.com for more details on this upstart operation, run by Nevin "Pinky" Knowles, his brother Leo, and sister, Darlene. Picture from Fly Talk, found here. I have never seen such a huge expanse of shallow sea water before. I also have been wanting to try my hand at some old school fishing for a little while now. It's starting to look more and more like I'm going to be heading to Long Island soon enough.